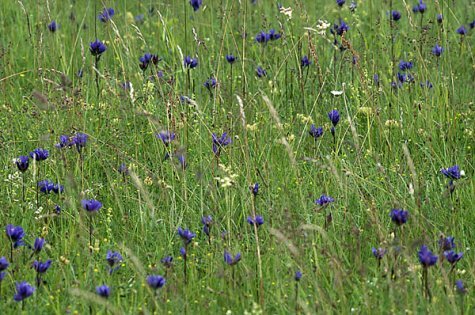 Dry meadows are the preferred habitats of clustered bellflowers; sometimes we find them in sparse forests, on road or ditch verges, in outskirts of parks, always near deciduous trees. The plant typically has dense foliage, pretty from the spring into late autumn. The flowers of the clustered bellflower are concentrated in the top of the stem forming a small globe, ten centimetres or so. 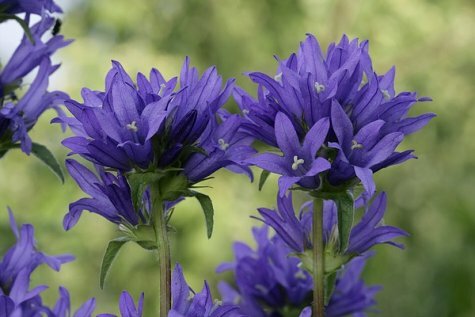 On examining the plant closer, you can see why this is so – the flowers of the clustered bellflower have no stalks. The bristly bellflower (Campanula cervicaria) looks similar and also has flowers without stalks, but its stem and leaves have dense, rough bristles and it is rare species of bellflower.